New-ness – This will only be solved by time and it will. Advertising – For BC Transit’s part, they could use some of that empty advertising space, both inside and out, to help promote the new line. Metro in Los Angeles has run some pretty good ads and increased choice ridership by a decent amount as a result. Express buses are loved by choice riders. UVic/Camosun and their respective student societies should work to get people on the ground to pamphlet their bus stops and let people know about the new buses, especially with the separated 15 stop at UVic. Stops – Most of these are fairly easy fixes as well. UVic – As I mentioned, a lot of UVic students are opportunistic riders, so the riders of the 15 will come from the 4, 7, 11 and 14. As can be seen from the image to the right, there is a massive amount of space between the exchange and the SUB. Given there is no space in the exchange for the 15, kicking out another bus to make room would keep the downtown-bound routes together. A logical route would be the 26, which is one of the busier routes, so would benefit from the extra space in front of the SUB, and its route only overlaps with a short section of McKenzie St. with the 39. Moving an existing bus line with established ridership is hard, but is easier than building up a new ridership if nobody knows the bus exists or is hard to easily find. 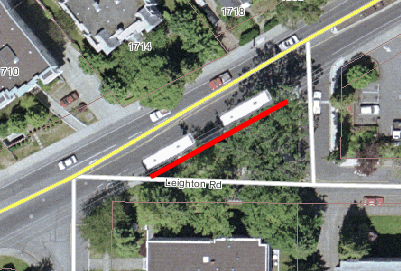 Fort @ Douglas – The City of Victoria is fairly transit friendly and is likely to be amenable to removal of parking spots to expand the bus stop here. As a bonus, the spots are in front of the Municipal Finance Authority building, who don’t have the same concerns as a storefront retail business with regards to parking. Fort before Richmond – A much harder stop, because the stop is on an island bounded by two roads, so it can’t be easily expanded. One option would be to have the 11 not stop here, as it stops just after Richmond about 100 m away, where the 15 currently does as well. This would keep the 14 and 15 at the same stop. Mistaken schedules – I don’t even know if BC Transit is even aware of this issue up ’til now, but this is a fairly easy fix. 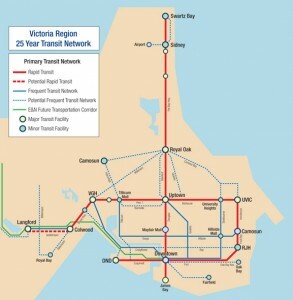 As a last note, I think BC Transit should break out its express routes, the new 15, the 28 Express, the 70, etc. and brand them differently, much like Translink did with the B-Lines.This kind of product differentiation is a great way to attract choice riders, people who could drive but choose to take a bus. Of course, it isn’t news that transit agencies are bad at marketing their own products, a fact which hurts their cause immensely. Late last year BC Transit introduced a new express route to UVic from downtown, the 15 (previously called the Dogwood Line). While this is only the second week of the new UVic/Camosun term, the buses are very empty, with the 14 still taking the bulk of the passengers along their (mostly) shared route. Why? The route is new – New services take some time for people to get used to their existence, so early ridership numbers are not usually good indicator of future performance. However, I don’t think this is the only problem. Confusion of signage – While in the planning stages, BC Transit started the process of adding the new route to the electronic signs on the buses. But most of this early work was undone when the transit commission decided against calling it the Dogwood Line, so only a portion of the buses were tagged with 15 UVic/Downtown Express and the rest had Dogwood Line. By this point this appears to have been fixed. Advertising – The new route has had zero advertising and barely even got mentioned in any papers. Any notice got shoved alongside the mention of the new 10 route along Bay. There are a bunch of organizations that could have stepped up to the plate for this. First and foremost is BC Transit itself, but the confusion of naming mentioned in the second point didn’t help. UVic Students Society and their Camosun equivalent, plus UVic and Camosun themselves could have gotten involved. So should VIHA, which runs the Royal Jubilee Hospital that lies about half-way along the route. The UVic stop is in front of the SUB, not in the main transit exchange. This is because of lack of space, but better planning could have made this easier. This placement means that the natural ridership of the 15, the current users of the 4, 7, 11 & 14, don’t see the 15 when they are waiting at their usual stops. There are missed stops along the way that make no sense. Two of the biggest stops they miss are Fort @ Douglas and Fort just before Richmond. Both are major boarding points for the 14 and to a lesser extent, the 11. Mistaken schedules at stops – Some of the downtown stops show the 15 on the printed schedule at the stop but are not actually stops for the 15. This just adds confusion. None of these are intractable problems and they will be solved, one or another. Tomorrow I will talk about some of the solutions that I see. The addition of the 15 has been a long time in coming and I am glad BC Transit is finally starting to think more about express & limited stop buses. While many transit organizations are in the middle of financial meltdowns, including the MTA in New York, BC Transit is set to buck the trend and expand bus service here in region (PDF) for the second time in less than six months. This fall brought (PDF) the new 12 and 13 routes out of UVic, some changes in service and more hours, while this January will bring two new routes, late night buses and the balance of the just over 40k more service hours. 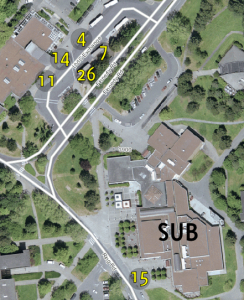 The first of the new routes is the cross town 10 route, running from the Jubilee Hospital to Esquimalt Dockyard along Bay St. and Esquimalt Road. This hasn’t been without controversy, as residents along Bay St. expressed concernd about the narrowness of Bay St. and “buses backing up traffic”. Joining the 10 is a new express route from Downtown to UVic. Route 15, nee the Dogwood Line, will shave 3 minutes off the current fastest route to UVic, the 14, with limited stops along the way. One of the challenges of running new buses to UVic is the lack of space in the current exchange, built in 1995, well before UVic’s student population hit nearly 20k, of which nearly 30% of which use the bus. To this end, the old bus exchange will soon become a new bus exchange, although it currently isn’t clear if the 15 will be using that space. Also coming are late night buses (PDF), an oft-requested service for those of us who actually like to spend time downtown after the sun goes down. This service won’t be cheap, costing BC Transit about $7 for each of the nearly 17,000 estimated riders during the 3 month trial period. Earlier cost estimates (PDF) put each bus at ~$400/hr to run, vs between $60 and $93 usually. This is mostly due to the extra shifts needed in operating and maintaining the fleet. Amongst the future options for payment include a U-pass cost increase, given the expected ridership is mostly students. Lastly and on the subject of fares, BCTransit has been looking for input on their fare increase plan, set to be implemented in April 2010. Currently they plan on removing the discount cash fare, addition of an off-peak pass and increasing nearly every other pass, ticket and fare. Full details in their press release (PDF). The date for feedback closed on the 15th of Dec and the transit commission will be voting on the plan on January 12th, 2010. 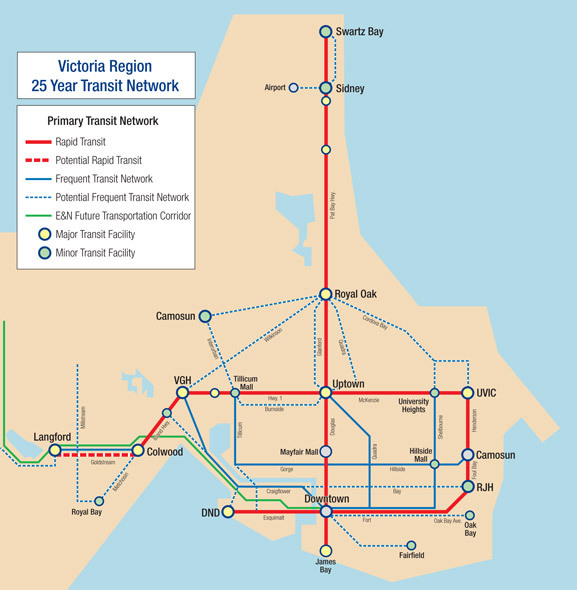 All in all, this is good news for transit riders, although maybe one of these days we might even get some rail transit here in the region, although I suspect it will be a long time before it comes to UVic.